Ok, I already know this, but some yarn isn’t suitable some types of garments. The Widdershins socks I finished in September last year turned out really lovely, but they’re already worn thin. 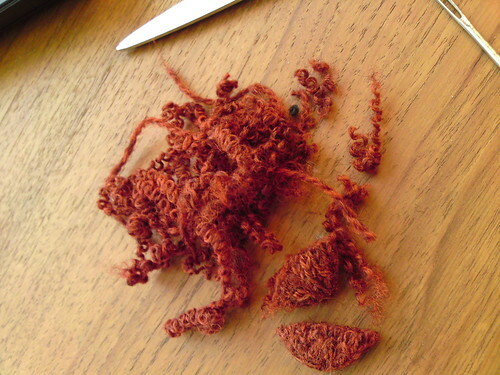 I used them perhaps twice in my boots, even though I knew that 100% merino really isn’t suitable for that kind of wear. It only made them slightly fuzzy on the back of the heel, but I decided only to wear them indoors after that. Sans shoes. I washed them. By hand. They stretched like mad and became too big for my feet. I gave them Stefan who has worn them quite a lot. Indoors. Sans shoes. They’re now worn thin on the bottom of the heels and under the ball of the foot. I noticed the other day that they were dangerously close to developing a hole. I realized that I don’t have enought Koigu left to mend all weak areas. 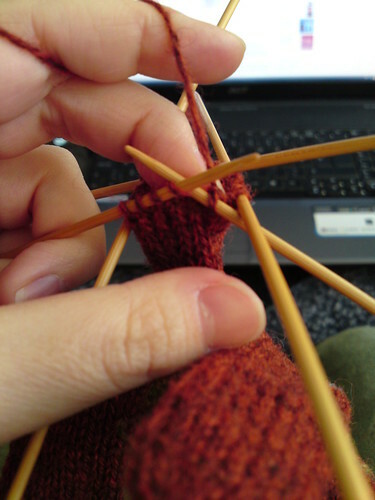 I have to find another yarn with similar thickness. But I managed to prevent a hole where the sock looked really bad. 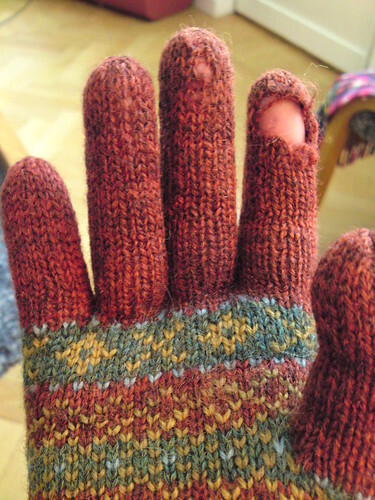 I have at least four pairs of hand-knitted socks with holes in them. I really must learn how to darn. And not use Koigu KPPPM for socks. When I was little I loved watching old news reel footage on the TV (they were edited into programs, often with a theme), especially the ones from the early forties which were sometimes about how to care for one’s things and clothes in order for them to last longer. This was of course during World War II, and even though Sweden wasn’t actually in the war, rationing was severe and buying new things was often not possible. My interest in how to get by in times of austerity has increased over the years. Most people in the western world live in relative luxuary today, and we do not need to be moderate in our consumer habits, but at the same time most of us are aware of that this is not a sustainable way of life. Sustainability and quality is someting we all need to consider and how we can contribute to a more sustainable world. One way is of course by consuming less. Taking care of one’s things and clothes in order for them to last longer. Mending what can be mended. Questioning whether you actually need that thing that you want. I try to think about these things and I want to contribute to a more sustainable society to the best of my ability. It’s not easy, of course. One way is by mending what you already have. 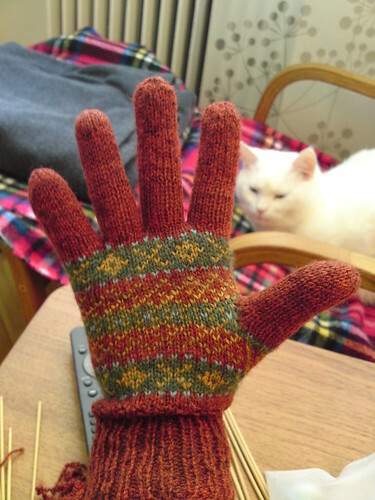 I have a pair of woolen gloves I knitted in 2007. I have mended these several times before, but last week they neeeded some TLC again. I reinforced some other stitches that weren’t as badly off to prevent them from getting worse. I’d love to hear your thoughts on making do and mending. 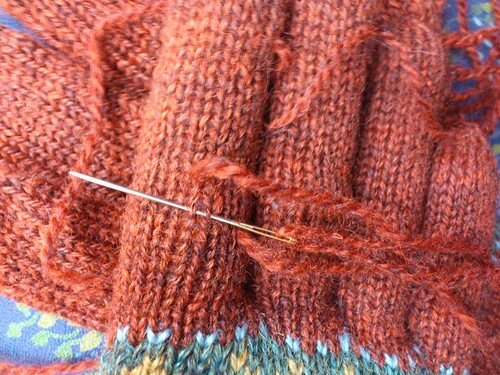 Do you mend your knits? If not, why? Brenda, who produces my favourite knitting pod cast, Cast On, dedicated a whole series to the Make Do and Mend concept back in 2009. I recommend that you check out her audio archive and download series 8 if you haven’t listened to it already.